The Gemini AS slide stainer brings state-of-the-art electronics, software, and mechanical design to the popular Gemini series of stainers. Its intuitive graphical touch screen makes training new staff fast and simple. The intelligent operation maximizes throughput by allowing multiple racks to be stained seamlessly. 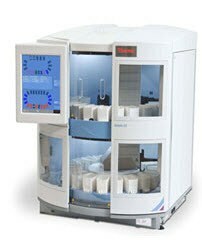 Gemini AS contains enough reagent stations to handle multiple stain protocols at the same time, and five heated stations to eliminate offline ovens... all within the smallest footprint of any full-function stainer, so it fits in your laboratory where you need it for maximum efficiency. Gemini AS has a clear and easy to use graphical interface. Current position and estimated end time is available at a glance for all in-process racks. With one touch the usage and status of any reagent can be instantly verified. With integrated monitor and power supply, the total width has been reduced to just 28” (72cm). It will fit where others cannot, to achieve the ultimate in lean workflow sequencing. 'Intelligent optimization' means control software that automatically arranges reagent positions to maximize speed and reagent lifetime. Duplicate reagents are assigned automatically according to expected usage, minimizing down time to replace reagents. Internal LED lighting provides better visibility of the staining area for trouble-free reagent replacement. External USB port allows rapid data download – get run reports and log files easier and quicker. Built-in reports make record-keeping simple and accurate. There are no threads in Thermo Fisher Scientific Gemini AS slide stainer Reviews at this time.